Map note icons and adornments but not the title part of containers/agents can use transparency. The transparency allows background items to show through where notes overlap. 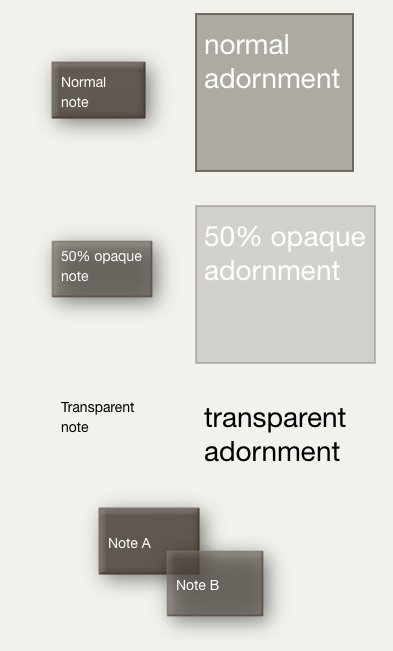 Note transparency is set via the $Opacity attribute, with 100 (default) being opaque and 0 being totally transparent. Unless the $Border is also set to 0, a note always retains a border regardless of transparency. An alternate and easier way to get a transparent (invisible) map icon for a note or adornment is to set $Color to 'transparent'. Doing this suppresses borders and drop shadows, but the title is left visible. However, if $BorderStyle is set to 'automatic' Tinderbox is clever enough to suppress borders if $Opacity is set to 0 (transparent). Transparency is effected within the normal stacking order of a map. Thus if transparent note A overlaps opaque B, if B has the higher $OutlineOrder, B will simply overlap A. If the $OutlineOrder is reversed A will both overlap B and B will be visible within the overlap. Adornments, by default, already have a built-in fixed level of transparency. This is because adornments are often used in overlapping layout and the semi-transparency enables the areas of overlap to be seen more clearly. If fully opaque adornments are desired, an option on the Maps tab of Document Settings allows this, but note that it is a global setting affecting all adornments and overriding $Opacity settings. If it is desired to leave the default document setting for (semi-)opaque adornments, then for adornments desired fully opaque it will be necessary to set their $Opacity value to greater than 100 (a value of over 260 may be needed). The opacity of a note's title and subtitle can be set separately from overall note opacity via $TitleOpacity and $SubtitleOpacity. Be aware that $Opacity still trumps the latter two attributes - if their values are greater than that of $Opacity, the latter value is used for all. Thus if $Opacity is 100, $TitleOpacity my be 50 - half that of the overall note. But, if $Opacity is 50, $TitleOpacity my be 100 the title is drawn at 50% opacity. In short, the latter ends up being generally what might be expected. It does preclude having a 'invisible' note with a visible title. To do the latter, set $Border to zero and $Pattern to "none" and $Color to the parent container's $MapBackgroundColor. Automatic colours - such as are used in note titles, obey $Opacity settings.